Hey Steve, I was at Buffalo Trace bourbon distillery today and they had some root beer for sale (made by their patent company). Naturally, your root beer blog was the first thing that came to mind. I hope this isn't weird or stalkerish, but I'd like to send it to you. After a couple shots of bourbon, it seemed like a fine idea, but now that I think about it I'm not sure I'd go giving out my address to just anybody. So if you're okay with it, where should I send it? I gave this kind stranger my home address, and soon I had a delicious box labeled "FRAGILE / LIQUID" sitting on my porch. In front of our toaster oven with a pizza inside. Perfection. 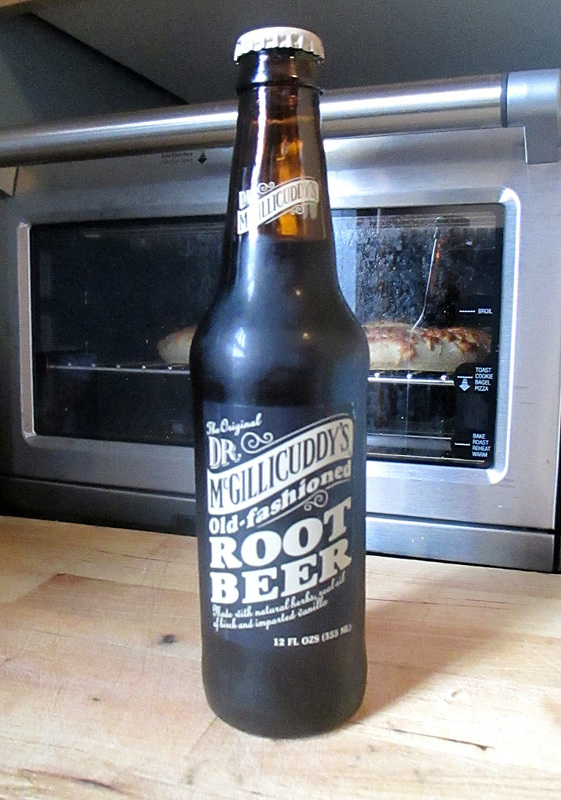 ... but I didn't know they also made root beer. Brand: Dr. McGillicuddy's Root Beer. Purchase Place: Mailed from a friend from Buffalo Trace Distillery. Sweetener: High Fructose Corn Sweetener and/or Cane Sugar. Review: This was nice and smooth. It had a strong vanilla taste which I like, but it wasn't overpowering. The "bite" was different, but good - it wasn't from anise or wintergreen, but it was from birch. (I still haven't tried any birch beers, but this makes me want to.) My wife maybe loved it more than me, and I thought it was pretty fantastic. It's a relatively classic taste with a bit of a unique bite, but not too "out there." Go try it! At the Buffalo Trace tasting room they serve this root beer with a bourbon cream for a sort of bourbon root beer float. Yummy!